Have you met BoB yet? If you haven’t then you are in for a great surprise. If you regularly find yourself missing arts and cultural documentaries or any sort of television programme you can now catch up whenever you like using Box of Broadcasts (BoB). BoB is an interactive media streaming service which is available both on and off campus anywhere within the UK. It’s a bit like BBC iPlayer but BoB can offer you much more. More choice: you can ask for programmes to be recorded from over 50 free-to-air television and radio channels. : In addition to asking for recordings to be made, you can also access programmes other people have requested from an archive of thousands of programmes, which is continually growing. More time: BBC’s iPlayer, programmes are only available for 7 days after being broadcast. If you request a recording from BoB, it will normally be available to view within 24 hours of broadcast and will then be available indefinitely. More features: Every BoB user has a personal area on the service called ‘My BoB’ which stores any recordings requested, playlists and clips that they have created.You can also view other people’s play lists and pick up useful resources. 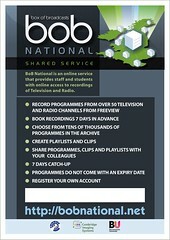 Any student or member of staff from the Royal Holloway can request recordings of programmes, up to 3 recordings per day. Programmes can be selected from any of the 53 channels up to 7 days in advance. BBC 1, BBC 2, BBC 3, BBC 4, ITV 1, Channel 4, Channel 5, News 24, Parliament, Radio 3, Radio 4, Five Live. Any requested programmes are then available in the archive and also in the requesting user’s ‘My BoB’ area. The BoB archive allows you to access not just programmes that you have requested but also programmes that users from any subscribing institution have requested. You can also access any publically available playlists and clips. Unlike the BBC iPlayer programmes do not disappear after 7 days but remain in the archive indefinitely. BoB allows users to create clips from a programmes or create a playlist of related programmes and/or clips. To add a programme to a playlist just click on the ‘Add to playlist’ link at the side of the programme. To create a clip from a programme click on the ‘Create clip’ link under the programme. All programmes, playlists or clips on BoB are given a persistent URL so their location will not change. Using your ‘My BoB’ area you can manage and access any recordings you have requested. Any programmes you have requested are listed here; if a programme has yet to be uploaded to the archive it will display a clock icon next to the title, once it is available to view the link will display as dark blue. You can delete a programme from your ‘My BoB’ area by clicking on the bin icon. More detailed information about the service can be found on the BoB subject guide pages.
. This includes information on how to register the first time you use it.